fortifying the "Atlantic Wall" along the coast of France - defenses intended to repel the inevitable invasion of Europe by the Allies. By the beginning of 1943, Rommel's faith in Germany's ability to win the war was crumbling, as was his estimation of Hitler. Touring Germany, Rommel was appalled at the devastation of the Allied bombing raids and the erosion of the peoples' morale. He also learned for the first time of the death camps, slave labor, the extermination of the Jews and the other atrocities of the Nazi regime. Rommel became convinced that victory for Germany was a lost cause and that prolonging the war would lead only to his homeland's devastation. He came in contact with members of a growing conspiracy dedicated to ousting Hitler and establishing a separate peace with the western allies. 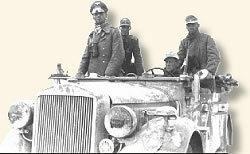 On July 17, 1944, British aircraft strafed Rommel's staff car, severely wounding the Field Marshall. He was taken to a hospital and then to his home in Germany to convalesce. 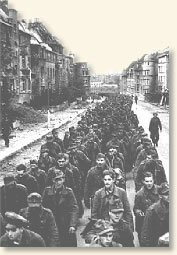 Three days later, an assassin's bomb nearly killed Hitler during a strategy meeting at his headquarters in East Prussia. In the gory reprisals that followed, some suspects implicated Rommel in the plot. Although he may not have been aware of the attempt on Hitler's life, his "defeatist" attitude was enough to warrant Hitler's wrath. 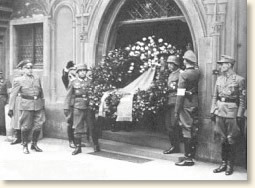 The problem for Hitler was how to eliminate Germany's most popular general without revealing to the German people that he had ordered his death. The solution was to force Rommel to commit suicide and announce that his death was due to his battle wounds. I tried again. 'Can't we defend ourselves�' He cut me off short. 'There's no point,' he said. 'It's better for one to die than for all of us to be killed in a shooting affray. Anyway, we've practically no ammunition.' We briefly took leave of each other. 'Call Aldinger, please,' he said. happening. My father now spoke more quickly. He again said how useless it was to attempt to defend ourselves. 'It's all been prepared to the last detail. I'm to be given a state funeral. I have asked that it should take place in Ulm. [a town near Rommel's home] In a quarter of an hour, you, Aldinger, will receive a telephone call from the Wagnerschule reserve hospital in Ulm to say that I've had a brain seizure on the way to a conference.' He looked at his watch. 'I must go, they've only given me ten minutes.' He quickly took leave of us again. Then we went downstairs together. Hart, B. H. Liddell, The Rommel Papers (1953); Manvell, Roger, Heinrich Fraenkel, The Men Who Tried to Kill Hitler (1964). Speaking in the House of Commons in 1942, Winston Churchill said of Rommel: "We have a very daring and skillful opponent against us, and, may I say across the havoc of war, a great general."